The scheme released earlier this week by top-tier team Oud-Heverlee Leuven foresees complete reconstruction of Den Dreef. Only the main western grandstand from 2003 would be retained and its double-tier layout should serve as model for the new sections around. First the new opposite straight would be built along the east side. 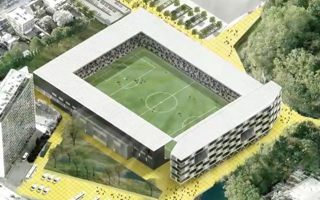 With 115 meters in length, it would hold 3,500 people, as well as providing 10 skyboxes, 2 cafeterias/lounges, infrastructure for players, club offices (250 square meters), the press area and a TV studio. Second stage would be the new north zone. Much more modest in size, it would provide room for 1,000 people. However, adjoining the stand will be a large student accommodation building. The club would not earn money off it, but the building should significantly change access routes and the stadium’s public image. Third phase will see the new south end enclose the stadium completely. It would be followed by an independent pavilion with new fanshop (twice the size of current one) and multi-storey car park. Early works were launched in the east in mid-2015 and should see the new east stand built before the 2016/17 season. The stadium’s structure will be simple, based on steel and concrete prefabs and will thus allow fast erection. It will also positively influence the cost, which is estimated at €5 million. €4 million will come from interest-free loans from public authorities, €500,000 from a grant by the Flanders and the remaining amount from the skybox lease. The loans have an interesting structure. First one (€2 million) will be paid off only when the club plays in the Jupiler League, potential relegation would put the payment on hold. Only after this part of the debt is covered, installments for the further €2 million would be paid.